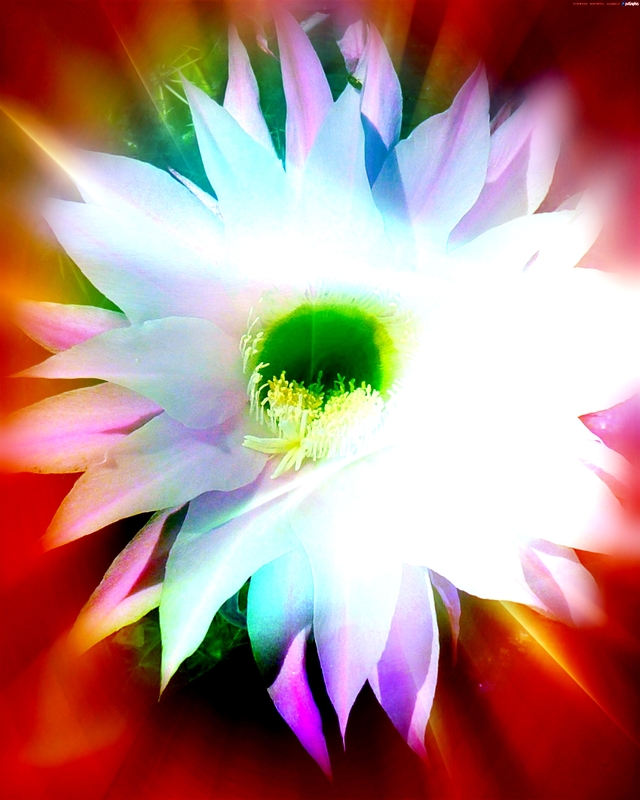 I created this digital art, The Heart of Lightness, with a pale green canvas on PicMonkey, superimposed with a photo I took recently of a cactus flower. When you go through the various layers you can use of an image in PicMonkey, you come across quite different colours and that’s what happened with this image. It morphed from pale green to the colours you see now (with a bit of tweaking in BeFunky!). I was drawn to create this image today to offer into the universe something with positive energy to counter in a small way the ugliness of the racism of Clippers’ owner, billionaire, Donald Sterling. I pity him that he thinks a person’s colour is important when what is really important is what’s in a person’s heart. Sterling’s comments show that, despite all his money, he’s really a rather pathetic, morally bereft figure. So here’s a bit of light to counter ignorant racism wherever it raises its ugly face. I quite like a phrase I read years ago, sorry, can’t remember the author: “Time to give racism an indecent burial”! And of course, “Heart of Lightness” is a play on the title of Joseph Conrad’s book “Heart of Darkness”! Hi Crazy Crone, What beautiful colors! thank you for your sharing. Wonderful. I will envision your canvas when they show him on the news for the millioneth time tonight. I’ll imagine that green Center as a small revolution of hope to transform the culture of my country. Not just your country, Rita, Australia needs some hope too given the way it’s treating Aboriginal people and asylum seekers.